I’m not a big Seth MacFarlene fan. I think the guy is hardworking and amazingly talented but for the most part I just don’t get his sense of humor. “Family Guy”, “The Cleveland Show”; what do people see in these? Every joke is telegraphed and sophomoric. I can see liking them if you’re a fourteen year old, but by fifteen you probably should have outgrown them. I’ve enjoyed MacFarlene’s movies much more. “Ted” and “Ted 2”, while not fantastic, were a lot of fun. “A Million Ways to Die in the West” is actually one of my favorites, although it appears I might be alone with that opinion. About a month ago, I saw a promo for “The Orville” and was not impressed. It looked me to be just more of the same over the top immature humor so I pretty much had written it off. Sunday night, my wife and I were out having dinner at a local pub when a commercial for “The Orville” came on. For some reason, perhaps excessive alcohol consumption, I thought it looked pretty good and decided I wanted to watch it that night. We finished off our food and headed home just in time to catch the beginning of the show. You know what? It was good. Actually it was better than good, it was great. MacFarlene plays Ed Mercer (sounds more like a name for a shoe salesman then a captain), who has just been given command of his first star ship, the Orville. He is surrounded by the typical characters you would expect in this type of show; some alien and some human. Among the more interesting characters are Lieutenant Gordon Malloy (Scott Grimes) his out of control risk taking helmsman, Bortus (Peter Macon) a Klingon like character reminiscent of Worf from Star Trek TNG and Commander Kelly Grayson (Adrianne Palicki) his first officer and ex-wife. 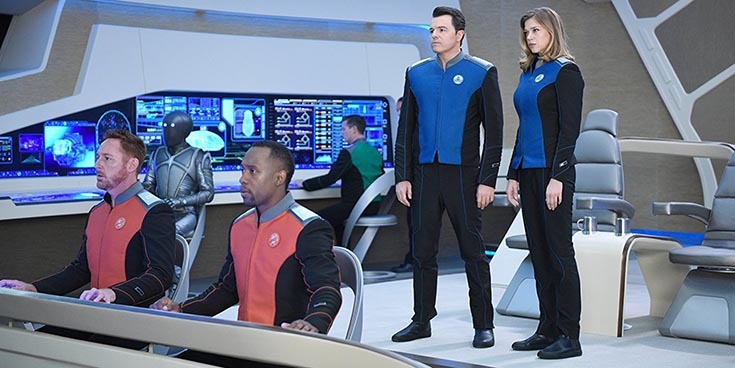 The plot of the first show was pretty basic, a device has been created that speeds up the aging of anything it its field and the crew of the Orville are called upon to safely transport the device. Although not a deep story, it served as a means to introduce the characters and give us an introduction to the show. As that, it worked well. The biggest surprise of the night was that even though the show was humorous, it was not over the top. They did not allow the comedy to get in the way of the story telling or character development. A big relief from what I thought was coming given the commercial they had used for promoting the show. “The Orville” also has a warmth to it much like the original “Star Trek”. The characters are likable and they make you believe they could actually be friends with each other. It’s refreshing to have a science fiction show on TV that doesn’t feel the need to be dark and depressing or feel the need to preach to us about social justice. It’s still early and things could still go horribly wrong with it, but if the first show is any indication “The Orville” looks really promising.